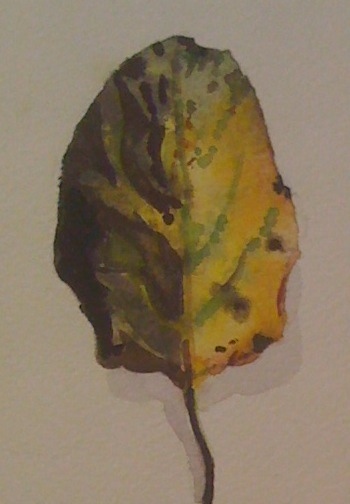 This is a tiny picture the leaf is painted at about lifesize. Summer holidays: life one long round of slogging round Sainsburys and prising children off their electronic boxes. There are nice flowers in the garden but for some reason I am painting the leaves that fall from the little pear tree. Only two more episodes of the Hour left to run….I could cry. If Hector is to be believed then my dad must have been in MI6 as I swear his raincoat, or gaberdine as he might have called it, looked just like the one worn by the ill-fated Mr Kish. He always seem to wear it with a trilby which is still a good look in my book, but then he was always hopelessly out of date only giving up wearing trourers with turn-ups when Oxford bags came in in the seventies…ie when they revived a look he had finally had enough of it and submitted to modernity…well almost… he wasn’t going to update the shoes or vests you understand.